Inspired by the mass-start race of the same name, the original Nukeproof Mega was one of the first enduro bikes that was race-ready out of the box. 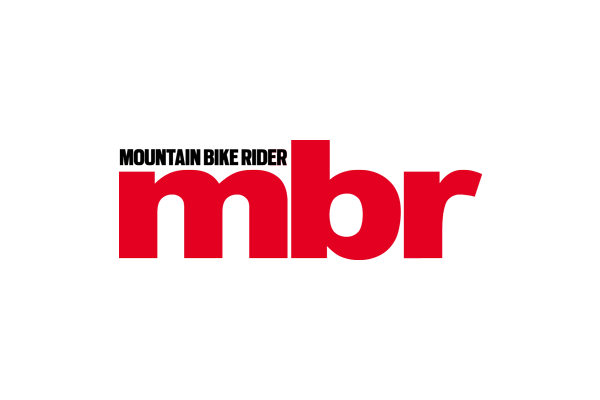 There was no need to swap to dual-ply tyres for extra puncture-resistance, fit a chain device or modify the geometry for stability; the burly 150mm-travel Mega TR had it covered. It was perfect for high-speed Alpine shredding, perhaps a tad over-the-top for UK trails. 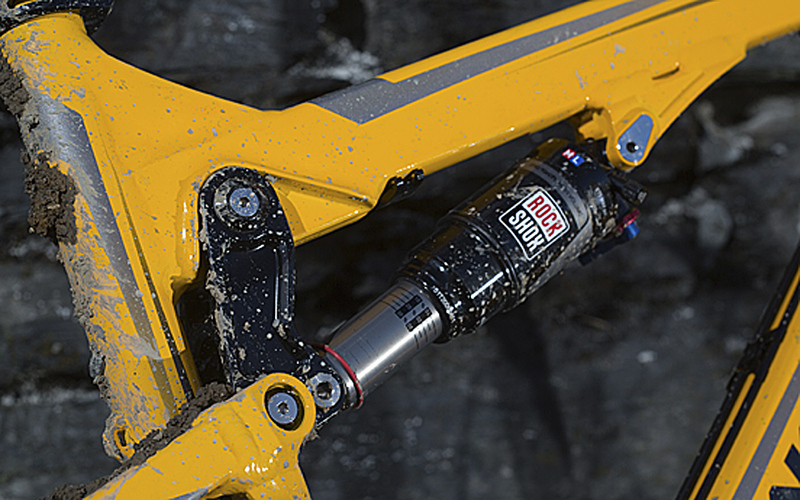 Enter the Nukeproof Mega TR. With 130mm of travel on the rear, married to a 150mm RockShox Revelation fork, the TR (trail) is essentially a lighter, more agile version of the original Mega — since replaced by the Mega AM (All Mountain), which our photographer Roo is currently running as his longtermer. Even with the change in travel, the TR still shares much of the original Mega’s DNA, including its slack, stable steering geometry and capable linkage-actuated suspension design, but at 13.4kg (29.5lb), it’s a competitively light, all-day bike that can take a beating. Having spent the past few months testing 29ers, I was a little apprehensive about jumping back on to a 26in-wheel bike. Wouldn’t it feel sketchy and unstable at speed? I needn’t have worried. The long front end, slack head angle and great cockpit layout gave the Mega TR stability in spades, and with the super-soft Maxxis front tyre, there was no shortage of grip. I was amazed at how hard I could punch through rocky sections of trail completely off the brakes without the front-end deflecting or deviating from my (sometimes suspect) line choices. Good thing, too, as the Avid Elixir 5 brakes proved unpredictable — transporting the bike upside-down in the van didn’t do them any favours, but Avid has had more than enough time to get its bleed issues sorted. 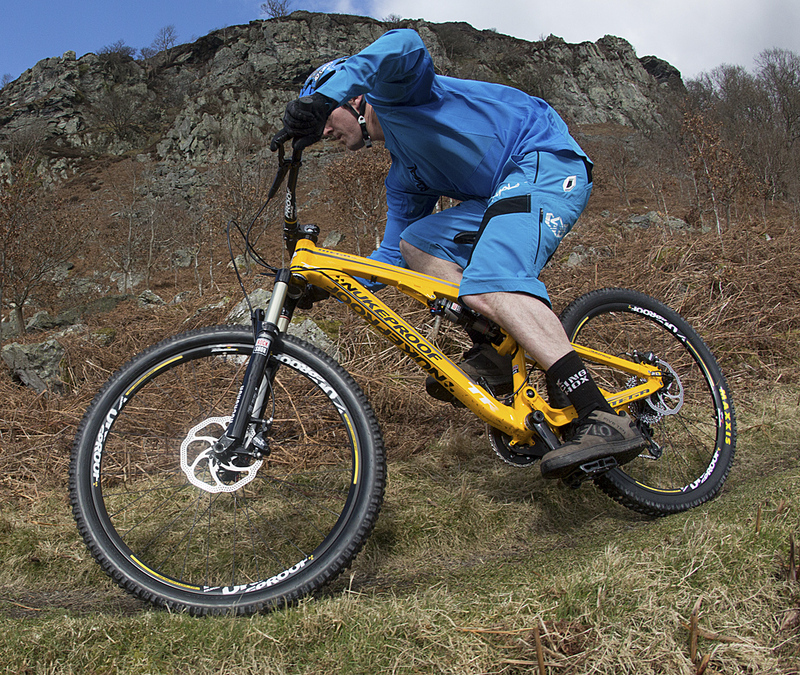 With a 36t single ring up front, you need to be fit to keep the Nukeproof Mega TR motoring on the climbs, but the steep seat angle helps keep your weight forward and the front wheel planted. Also, because most of your weight is on the regular-compound rear tyre when climbing, the Mega TR isn’t anything like as sluggish as you’d expect when you have a Super Tacky tyre leading the way. It’s pretty much the perfect set-up for grinding up fire roads to blast the descents. Chunky tubing means the frame looks stout, and is super stiff, direct and responsive when you put the power down. It’s also reassuringly solid when you overcook a jump or get out of shape. On rolling sections, I was really impressed by how easy it was to pump for speed, and the overall altitude belies the travel. That’s probably because the Mega TR uses its 130mm sparingly; the suspension never felt mushy or overly active. It always seemed to have a little in reserve for the roughest sections. Although it has only 130mm travel at the rear, it’s used so effectively that it affords a much tighter response when getting on the gas. 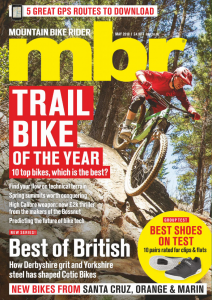 I’m convinced that the Mega TR would be faster than its big brother on most UK enduro courses and for regular trail riding. The Nukeproof Mega TR is proof that you don’t need a new wheel size to build an amazing bike, but with 650b rapidly becoming the next big thing, the timing couldn’t be worse. This a great bike, but it may never get the credit or popularity it truly deserves, just because it doesn’t have the latest ‘must-have’ wheel size. We Love: The neat combination of the original Mega’s bomber attitude with a lighter, tighter, distinctly UK trail focus. We Hate: that the rising popularity of 650b means that many riders won’t even consider this bike, even though it’s a great package. 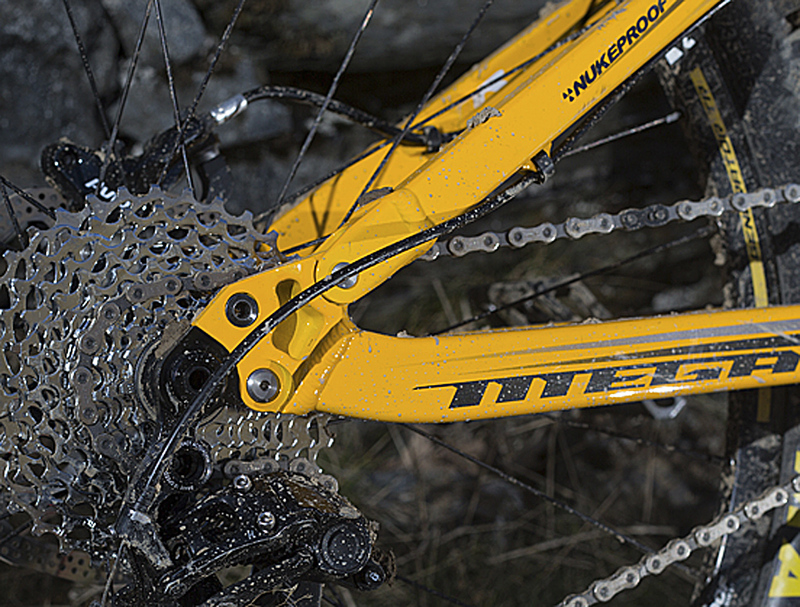 With a 36t chainset you’ll make full use of the 10-speed cassette. Just 130mm travel at the rear, but it’s very effectively used.